In mid-May 2015 the Zika Virus (ZIKV) was confirmed responsible for a growing number of cases of an exanthematic disease spreading through a number of Brazilian states. Since that time, transmission of Zika virus has occurred throughout much of the Americas and as of July 14, 2016, a total of 50 countries and territories worldwide reports active transmission of Zika virus (http://www.cdc.gov/zika/geo/active-countries.html). On February 1, 2016, the World Health Organization declared a Public Health Emergency of International Concern because of clusters of microcephaly and other neurological disorders in some areas affected by ZIKV. We expanded GLEAM model by incorporating vector population and disease dynamics between hosts and vectors, as well as socioeconomic indicators, so that we are able to provide a quantitative analysis and projections of the spreading pattern of ZIKV in Americas. 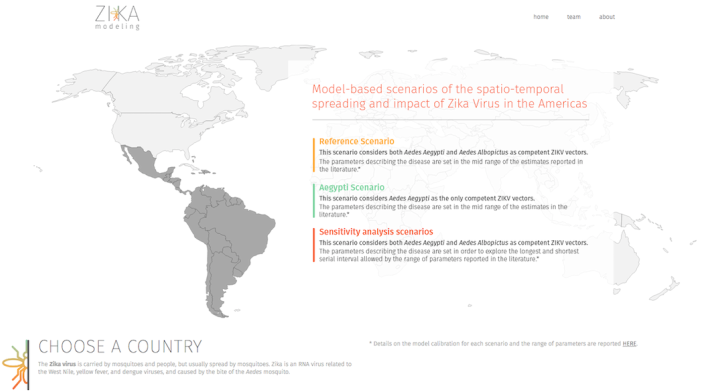 The research results are delivered in the written manuscript Spread of Zika virus in Americas, published in PNAS and in the project website ​www.zika-model.org. I have been working on seasonal influenza forecasting, partly as CDC's collaborative challenge on flu forecasting, from season 2013-2014 to now. We have been developing a framework, assimilating digital social data to mechanistic models and machine learning models, to provide real-time forecasting of key indicators of a flu season and short-term predictions for surveillance signals. We also built FluOutlook project, an online platform to provide real-time influenza-like-illness (ILI) forecasting for the public. This methodologies and forecasting results are delivered in written manuscripts "Forecasting seasonal influenza fusing digital indicators and a mechanistic disease model", published in WWW2017, and "Social data mining and seasonal influenza forecasts: the FluOutlook platform", published in ECML-PKDD 2015. I am in the research team of EbolaTracking. EbolaTracking relies on the Twitter global conversation to provide an awareness tool able to follow multiple events in a georeferenced context and in real time. I am a member of the team working on predicting seasonal influenza in Italy in 2013-2014. The proposed method involves the use of epidemiological data collected with the participatory platform of Influweb to generate the initial conditions of a model of epidemic spread that provides predictions for the flu season in progress. The prediction results can be found here (in Italian). I am the web developer and research member of the team working on the project The Twitter of Babel. We have also developed a web site that allows the interactive exploration of the languages found in the twitter signals around the world. Clicking or selecting a country will give the map of Twitter signal in different languages, as well as the percentage of twitter signals in that country.